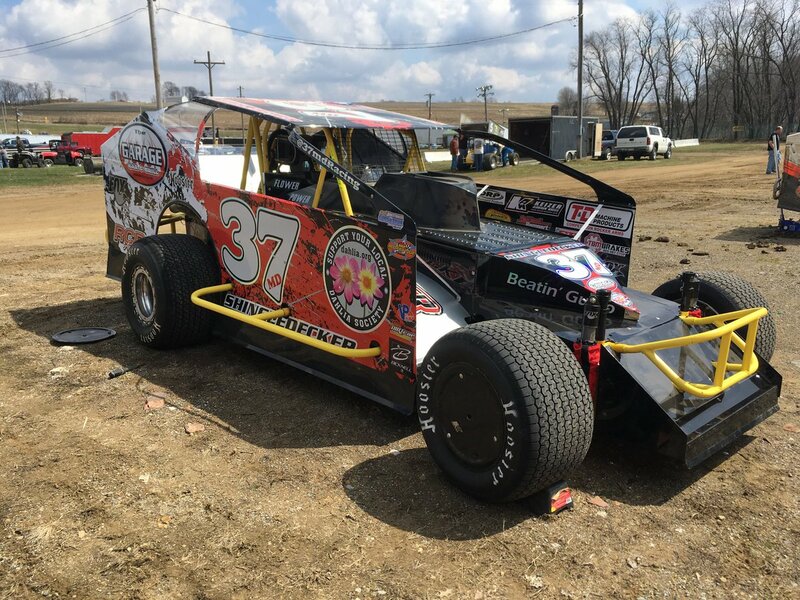 You are here: Home / 37MD Racing / Victory on the Mod Tour at Sharon Speedway! 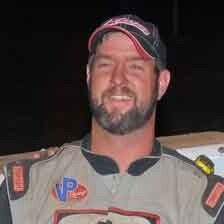 Victory on the Mod Tour at Sharon Speedway! (August 25, 2018) Jeremiah Shingledecker was on a rail. Shingledecker found the extreme outside around the fence to his liking as he charged from the ninth starting spot to drive around Canadian Tyler Willard on lap 16 and never looked back to win the 35-lap Mod Tour feature. It was Shingledecker’s first Sharon win since the $2,000 “Lou Blaney Memorial” back on July 8, 2017. Shingledecker’s first Mod Tour win of the season was also worth $2,000. Willard raced out to early lead, while Rick Regalski passed Rex King on the opening lap for second. A five-car accident slowed action with two laps scored as the next 31 would go caution-free. When racing resumed on lap three, Will Thomas III and King battled side-by-side for third until Thomas made the pass on the outside on the fifth circuit. The top four of Willard, Regalski, Thomas and King began to distance themselves from the field on lap six. Shingledecker entered contention on lap nine when he flew around Jim Rasey for fifth. On lap 12, Shingledecker made quite the move as he drove around both King and Thomas for third. Shingledecker caught Regalski on lap 13 and continued to make the high line work driving past him off turn four for second on lap 14. Willard’s lead quickly shrunk as Shingledecker made the winning pass off the top side of turn four on lap 16. Thomas would regain the third spot on lap 17 getting by Regalski. Shingledecker had a straightaway lead built up by the time he entered heavy traffic on lap 23. Shingledecker’s lead continued to grow, while Thomas caught Willard in the battle for second on lap 28. Jim Rasey had just passed Regalski for fourth on lap 31, but Rex King, Jr. flew around both Regalski and Rasey for the spot on the same lap. The event’s final caution slowed action when Rich Whitney spun and collected Jeremiah’s brother, Travis Shingledecker, with 33 laps scored. Jeremiah Shingledecker’s big lead was erased setting up a double-file restart for the two-lap shootout to the checkered. 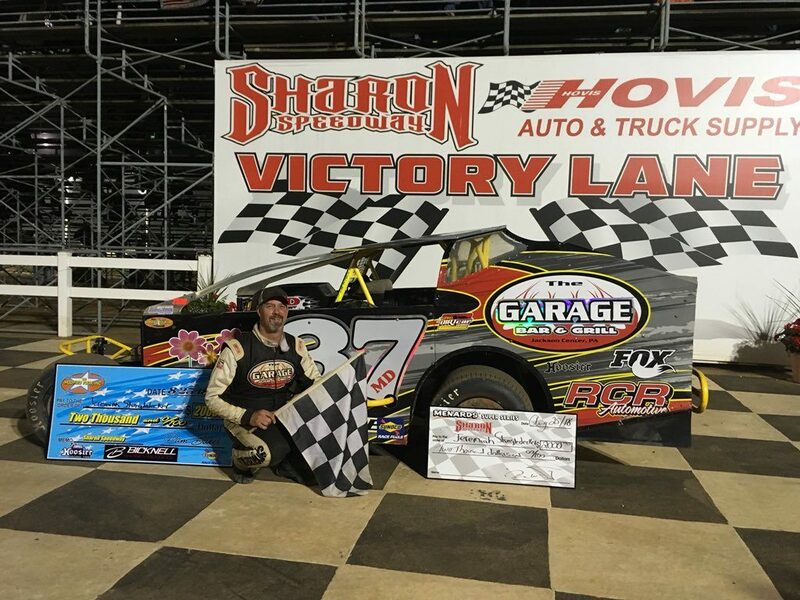 Shingledecker chose the outside and quickly pulled away as he drove off to his fourth career Sharon win by 1.797 seconds in his The Garage Bar & Grill/RCR Automotive/Fox Shocks/Fast Shafts/Jones Racing Products/Simpson-sponsored #37MD.